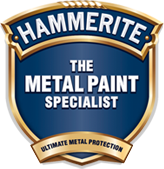 Hammerite Direct to Rust Metal Paint is specially formulated to be applied directly onto new, old or previously painted iron or steel for the exterior. Shabby and dirty railings covered in rust give off a poor first impression of your property. This problem can be easily solved using Hammerite Direct to Rust, and once the task is finished it will look good for years to come. If you have a metal framed table or chairs, you may not realise it can be easily decorated for a new colour or to improve the paint finish directly onto rust. Hammerite has the specialised products to help you. It can be simple and rewarding to rescue a bench which has seen better days. Follow the instructions on the Hammerite products to rescue a rusty wreck.